The nightmare tenant/landlord/tenant/landlord situation that has crossed into two states (our house in CA that we were renting out, plus our rental in TX) is almost over. Our house that we were selling in CA closed last Friday. I expected to feel lots and lots of relief, but I actually felt quite a bit of sadness. We bought that house so that we could adopt one of our foster kids, but she ended up leaving us 3 weeks after we moved in. We used that house to foster two more kids. We hosted quite a few of our children’s birthday parties on that deck. We did all of our first DIY projects there together. For it to end on such a sour note with the thousands of dollars in repairs plus the high stress tenant situation is just really too bad, in so many ways. That house was our beacon on a hill, the house we should have never been able to afford but somehow managed to. It was our long awaited prize at the end of a journey, and our parting memories and videos of the house back in July were so sweet. In many ways, I would like to think that we truly sold the house back in July, and that the nightmare of the last 6 months was a completely different house. It helps me to remember the good things fondly, without letting everything be tainted. The house will be a big change for us in many ways. We’ve been living 3 blocks away from Jesse’s work for the last 6 months, but as I’ve mentioned in other posts, the area is super crime ridden (we hear gunshots at least once or twice a week, no joke), and our landlord is a slumlord. Our new house is 15 minutes away from his work, which means that we will need to buy a 2nd car for the boys and I. The last time Jesse and I owned two cars was back in 2011! One thing that will not change is our square footage. Our new cottage/house is under 1100 square feet, which is quite small, especially by TX standards! We looked at house after house with a lot more square footage, and we were even in escrow on one twice this size for about 2 weeks. So why on earth did we trade a much bigger house for something that has the same square footage as our rental? Perhaps it’s because we’ve moved so often, but we’ve also never allowed ourselves to build up junk. We are always purging, selling, reusing. When we moved across the country for the THIRD time in this decade, we downsized almost everything, and still continued to sell stuff once we arrived at TX. And so the idea of a small house became quite appealing to us. I’ve been dreaming of even one day owning a “tiny” house on wheels, but in TX those are super unrealistic (tornadoes, anyone?). We also have two boys with a LOT of energy and realized that anything under 1000 square feet would be too tough, at this juncture anyways. So an 1100 square foot house sounded like a great compromise. One of the startling bonuses is that our homeowner’s insurance is incredibly cheap as a result! In fact, our auto insurance for ONE car is TWICE the cost of the house insurance! Buying an older, smaller house meant that we were able to get into a cool part of the city, known for it’s walking trails, the Dallas Arboretum, and White Rock Lake. And don’t get me started on our tiny monthly mortgage, which is less than half of what we were having to pay in CA. Since we are basically a one-income family, this part is crucial! We will be adding on, eventually, once we save up enough extra pennies. First, we actually have to pave a driveway around the back and add a garage and an external outlet (when you have an electric car, those are kind of a MUST have!). 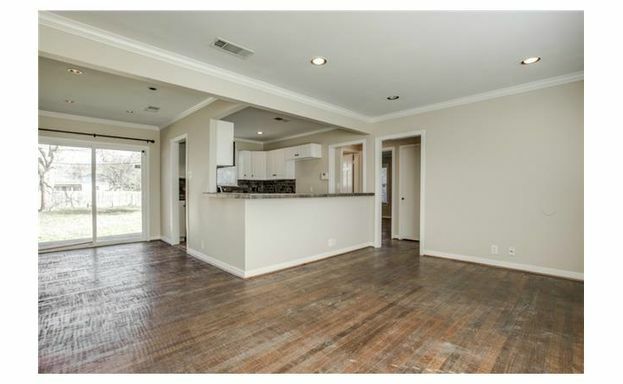 We already have the open floor plan that we wanted– the giant dining/kitchen/living area definitely feels like a loft, which is something we’ve always wanted. But first, we have to make this move happen on Saturday. I also had a grad school presentation yesterday, along with another paper due next Monday! Looking back over 2014, it’s surprising to me that my favorite and, coincidentally, most popular posts were about foster care and adoption. All of these posts were written out of desperation– a way to express an overflowing amount of frustration and emotion. 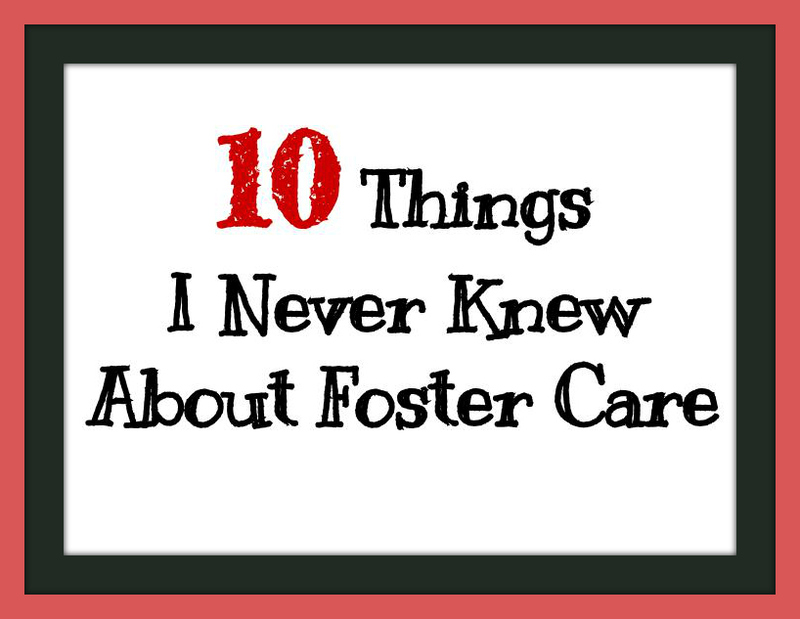 This post, titled 10 Things I Never Knew About Foster Care, was found and featured on Adopt US Kids. I had no idea it was on there until I started getting thousands of hits. When I tracked down the actual Facebook post containing the link, I felt beat down and discouraged by the negativity I found. After I regrouped my emotions, however, I realized that 99.9% of the feedback was positive, filled with relieved fellow foster parents who were thankful that they weren’t alone in their experience. I learned that to be a blogger, one has to hear the negative feedback and ignore it, so long as one can evaluate the situation honestly. I wrote this follow up post as a defense for why I blog about foster care, and it gave me a lot of much-needed clarity and peace of mind. My second favorite post of 2014 was an open letter I wrote to one of our foster children, a boy who no longer lives with us but is still very near and dear to my heart. I think about him every day, and this letter remains as proof that we loved him and loved the gift that he gave to us. This post went viral when it was featured on Parenting Magazine’s website. I felt so honored that others got a glimpse of the change that foster care has produced in my heart. This has been one of those posts that I’ve been putting off for months, to be honest. Over the past 2 years of doing foster care, there are still so many parts of our story that are too muddled, too raw to talk about yet. Some of these things I will never talk about in this forum. Generally, I have a rule of thumb when publishing anything foster care related– if I can do substantial good by writing it and putting it out there, then I will do it, however painful it might be to sort it all out. Come what may. And so. So we press on. One of the biggest concerns about ever embarking on the journey of foster care was about how it would affect our two biological children. Our first placement happened when AJ was just 5 months old, Gregory barely a 2 year old. Looking back, I’m still not even sure how we did it. Ever heard of postpartum hormones? The worst part about them is they are coming on the tail end of pregnancy hormones, so one sometimes forgets what “normal” ever used to feel like. Then you add a grueling/grisly house hunting experience, along with foster care. Sounds like a recipe for burnout and disaster, no? It took months to even begin to realize how our family had been affected by our first placement. It’s also hard to determine what caused what, since our lives were in such turmoil with the house hunting/moving process. But both of our kids, despite their young ages at the time, definitely showed signs of being emotionally beat up. AJ, who was 11 months old when our first placement ended, finally slept through the night just days after. One day, he was waking 6 times a night, unwilling to eat or be soothed. A few days after the placement ended? He slept through the night peacefully and never looked back. It’s as though he’d been trying to, but couldn’t. Gregory was 2.5 at this time and we actually didn’t notice the damage right away. But then things would happen, like a brief visit from our first placement, an argument between Jesse and I (there were quite a few during those recovery months), a lost toy. Like a thread unraveling, we started to see some of the ways in which it all had affected him. The hardest episode was over Christmas break, when our first placement came to visit. The moment the visit began, Gregory began to whine and cry, like the beginnings of a tantrum. Slowly, he retreated to his room, where he sobbed the rest of the hour. After the visit was over, I went in to scold him for being unfriendly, only to witness one of the most gut-wrenching sob sessions I had ever seen come from my small 3 year old’s body. He wasn’t kicking and screaming, he was just crying as though his heart was in pain. I felt panicked, because I had no idea what to do. Holding him didn’t work, offering him distractions didn’t work, and it didn’t seem like he was slowing down. Finally, by divine inspiration I figured out how to assure him in a way that made sense in his 3 year old mind, and it clicked. Within a few seconds, the sobs had died down, and he was willing to be comforted. I remember one of the first days our 2 new placements, our 10 and 5 year old boys, came to live with us. All of them were jumping on the couch together, somersaulting and flopping on the cushions (actions we got to know all too well over the next few months). One of them got too rough, and all of a sudden I heard Gregory say in a stern voice, “NO. DON’T DO THAT. Get OUT of MY house!” He didn’t understand that his house was, without his consent, about to be shared for 8 months with 2 strangers. His playroom, about to be packed and put away. His Christmas with family, shared, his toys no longer just his, his mommy and daddy’s attentions, distracted and redirected. Jesse and I were stunned. “Are you going to send me away like A and N?” he said, wiping his nose, still crying, looking anxiously at us for the answer. I felt sick, like someone had punched me in the stomach. My heart was in pieces. We spent hours that night and every night after, assuring Gregory that he would never be sent away, no matter how much trouble he thought he was in. We explained that we were his parents, and I made a big deal about routinely mentioning how he was a baby that grew in mommy’s tummy. These were hard things to do in front of our foster boys, however, since things with their biological family fell through shortly thereafter and talking about Gregory’s security within our own family felt like rubbing it in their faces. And, of course, all of this brought up questions from Gregory about why A and N weren’t with their mommy and daddy. We had to talk about how their mommy and daddy were “bad guys”, but that not all mommies and daddies are bad guys. To this day, I still hear him muttering under his breath about how “grownups are bad guys and might hurt us.” It breaks my heart, every time. Every mom I’ve talked to who has young kids and is also doing foster care has this moment, where the horrifying thought creeps up and dawns on them– am I doing the wrong thing? Have I just traumatized MY kids by trying too hard to help someone else’s? It sneaks up before you know it. It’s also incredibly difficult to battle the fear that accompanies it. When we first took in the boys, I feared the kind of influence they would be. I feared bad words. I feared sassy talk. I feared germs. I feared picky habits ruining my organic food/lifestyle dreams for my 2 babies. I feared that we wouldn’t have enough love to go around, that they would feel ignored or replaced. And, at times, those fears would be validated. We did, in all honesty, have a few physical scuffles that made me worried to leave the boys alone together. We all got sick 8 times in the first two months. The boys were siblings, and some of their vicious bickering rubbed off on AJ and Gregory and has set some of their current behavior. I remember one time when Gregory was running towards Jesse’s outstretched arms for a hug, only for N to come up behind him, shove him out of the way, and get the hug instead. But what I didn’t realize would be so hard would be them leaving us. I didn’t know how to tell Gregory that they would never live with us again. Another time, when Gregory and AJ were fighting, I saw Gregory pull back, and, with a cold tone of voice, say, “It doesn’t matter. He’s not my brother any more. He’s just a friend to me.” Because that’s how it worked in his mind, based on the example set before him. Family isn’t something set in stone, it’s something that changes according to bad decisions people make. Gregory has just recently begun watching more mature cartoons, the kind with real bad guys in them. As much as I try to limit TV in general and steer him towards bright and happy toddler shows when we do, he is drawn to the ones with good and evil displayed in all their monstrosity. When the dragon breathed fire at the command of the evil witch at Disneyland’s light show, he was enthralled, tense with anticipation, and delighted when Mickey saved the day. At the age of 3, he can explain in full detail why the Decepticons should be torn apart, limb by limb. There are days when I grieve this fascination with bad guys, because I mourn those 2 years of innocence he missed out on. Before he even knew my first name, he’d learned that mommies and daddies sometimes do bad things to their children, and that not all adults can be trusted. Before he’d truly learned what a brother was, he learned that they could be taken away from him at a moment’s notice. Before he’d learned the alphabet, he learned that his mommy and daddy were vulnerable and could, at times, appear so weak that they weren’t going to make it. I know that those days of foster care are some of the reason that Gregory is so protective of me at this current juncture. Sometimes, in church, he tells me to sit down and take care of myself. He tells me I need help and that he’s the one to do the job. He tells me when I am looking tired and tells me to rest. During these moments, when he looks at me with such love and tenderness, I can’t believe that he is only 3, because it feels as though he is going on 33. I mourn that he is so wise beyond his years in some of these ways, because it makes me feel as though I did not protect him. 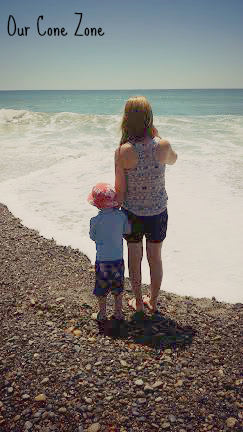 For me, this feeling of failing to protect my son’s babylike innocence has been the hardest thing to process about foster care. G.K. Chesterton goes on to make the point that children know that there is evil in the world. They have their own fears, they don’t need someone to introduce fear for them. What a fairy tale provides, however, is an answer to that evil. An adult that denies their child a chance to see true evil also denies them the chance of seeing that same evil defeated. Without evil, you cannot have someone to save the day. Without the dragon, you cannot have a knight to slay that dragon. Or loving parents to embrace the boys mistreated by their biological family. Or security in a home despite all of his toddler tantrums. Or a brother that will always be there beside him no matter how many arguments they get into. And then I realized that Gregory would have had all of these same fears eventually, even if we’d never done foster care. And I become so grateful that not only have many of these fears been voiced and put on the table, but he’s seen their quick defeat. And when he looks back on this someday? I hope he looks back and feels the pain of all the children who have no loving parent or home, knowing deep within his heart that evil will be conquered, good will win, and that he is loved unconditionally. And, if not, he has a trust fund set up that he can choose to either use for college, or for therapy, depending on which he needs more. Over this past year, I have begun using doTerra’s oils. I haven’t made a huge deal of it here on the blog, because I wanted time to test it out and see how things went. But it’s hard to keep quiet, because I can’t stop posting about some new thing I’ve cured, some recent ailment of mine that I’ve alleviated. Long and short, I LOVE my oils. They’ve changed my health for the better. But that’s definitely not what all this is about. This remark stopped me in my tracks. 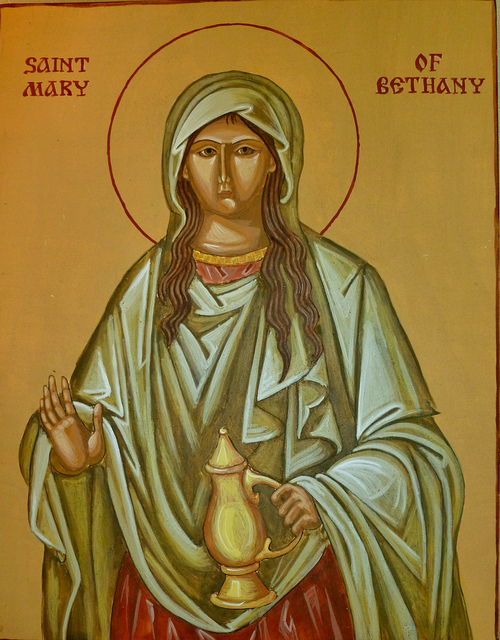 Mary of Bethany has been my Patron Saint ever since I was chrismated, 7.5 years ago. I even have her icon in our family’s prayer corner, holding a bottle of oil. And yet, I had never put two and two together. 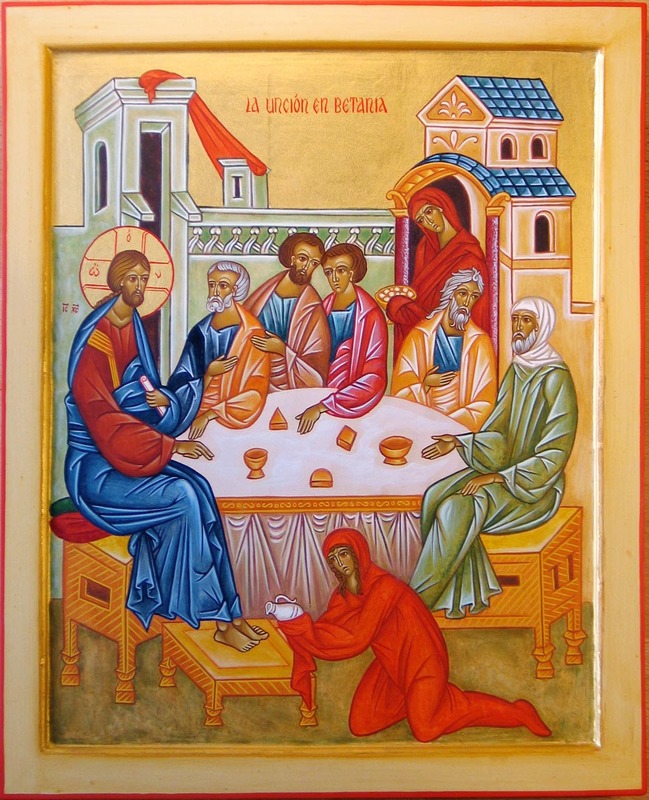 You see, I chose Mary of Bethany because she was the sister of Lazarus and wanted to sit at Jesus’ feet. In fact, in every icon, she is always pictured at the feet of Jesus or holding one of his feet. She was a listener and a friend, not just a doer like her sister, Martha. You guys, I AM naturally a Martha. And I really don’t want to be. It’s one of my greatest goals in life. Slow down long enough to listen and love people. It’s one of the reasons I’ve intentionally decided to be a 99% stay at home mom during this season. But I had forgotten the other reason Mary of Bethany is so famous. She was the one who poured expensive oils all over Jesus’ feet. These were precious oils she had been saving for her own funeral someday, or maybe to heal a loved one. But Jesus was what she loved. She wasn’t going to wait for another answer, another healer or another Messiah. He was it. And she didn’t just pour that thing out, she BROKE open the jar. Gave him everything with hopeless abandon, smashed the vessel, showed that she was all in, holding back nothing. Judas rebuked her, just as her sister Martha did for sitting at Jesus’ feet, many years prior. He didn’t want her wasting such a costly thing for no apparent reason. He didn’t understand that what he was watching was Love without restraint. Love looks foolish, Love looks like a pointless waste of resources. Love doesn’t make sense when it’s viewed by someone in “go” mode. As I think about my precious oils, these doTerra bottles that cost me hard-earned money, I remember all the times when I’ve counted drops and metered them out. And then I think of all the times I’ve metered out my personal resources. I’ve avoided helping friends because I’m worried I’ll be too tired or too frustrated. I’ve refused to let my husband serve on parish council because hearing about all the drama every week made ME so mad, not him. I think twice before every invitation, every chance to go out and do something, every perceived need for those around me. Worst of all, I’ve even metered out my time with my Savior. When deciding whether or not to go to extra services on a Wednesday or Saturday night, I start thinking about all the things I have to do for the coming week and the thought of wrestling my kids to keep them quiet just sounds too draining. Instead of praying by myself before the kids get up, I squeeze out every last drop of sleep because I “need” it in order to keep from getting worn down. I don’t break bottles of oil over Jesus’ feet in my day to day life. I measure those drops out, giving Jesus what I think I can manage, instead of trusting Him with all of it. Just as I need to learn to listen at Jesus’ feet as He shows me how to love those around me, I also need to learn how to let go of my resources when it comes to Love. I had an experience after church on Sunday that I’ve barely mentioned, even to Jesse. We were on our way downtown, going to look at an open house. We decided to kill some time and go to the ONE Peet’s coffee house in all of Dallas, smack dab in the middle of downtown underneath a Sheraton hotel. We decided that I would run in so that we could save a few dollars while parking. As I was running in, rushed because I “needed” my coffee fix, a homeless man who’d been sitting there asked if I’d give him money so that he could eat. It was this weird experience, where I heard the words, but I didn’t even know I was saying them. Almost like the words were spoken from somewhere, skipped my brain and went flying out of my mouth. I was confused. The man was confused. He followed me in, but I had to urge him on several times, because he didn’t understand what was going on (neither did I!). And there we were, standing side by side at the counter. The woman who was supposed to be working the cash registers decided to take her time doing other things instead of helping us, which made for a loooong time standing side by side. One of those, “not sure where to look or what to do” moments. You guys, I’m not a friendly person when it comes to strangers. I just stand there awkwardly, hoping it’s all over soon. The man ordered coffee– an order he changed because he heard me order 2 iced coffees, and he said, “What’s that? Give me one of those!” He’d never had iced coffee before. And I realized, I don’t do that. I don’t do this. I try to give, but then I expect my giving to be measured into predictable boxes that I can control. I’m the foster mom who was okay with her kids and their pain until it invaded every last corner of her life. I’m the mom that can agree to move across the country with her husband to chase a good job and grad school– so long as I have my home, life and friends in order. I’m the wife who will only let her husband serve at church if it doesn’t interfere with her kids’ nap schedules. I don’t response well to my resources being ripped away from me. I don’t respond well to being asked to give them. But I want that to change. And with God’s help and the example set before me, I think I can. Breaking bottles of oil, one day at a time.